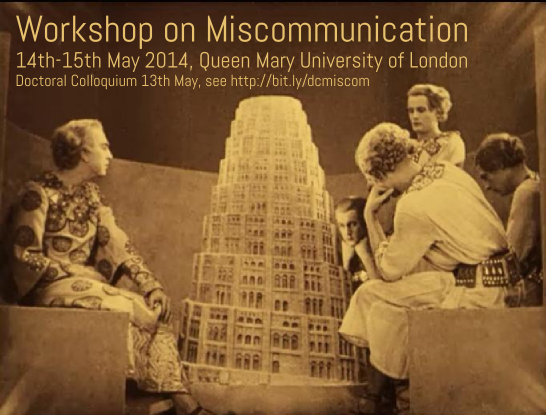 In association with the 3rd International Workshop on miscommunication we will be holding a doctoral colloquium at Queen Mary University of London on Tuesday 13th May 2014. The doctoral colloquium will be an informal space for PhD students to discuss the ideas they are currently pursuing, their methodologies and approaches. Participants will be invited to discuss and develop questions for a session at the main workshop, and will be involved in documenting the proceedings. We hope the colloquium will provide a rich opportunity for students to make new connections and foster potential for future collaborations. You will also have the opportunity to discuss your work with some of the leading academics working in this area. The colloquium and workshop will take place at the postgraduate research centre at QMUL’s Mile End Campus (see this campus map http://www.qmul.ac.uk/docs/about/26065.pdf). The colloquium is free to attend, and includes access to the main workshop, but is limited to 15 participants. If you would like to participate in the colloquium we request that you send us a short abstract about your research (250 words max) by Monday 31st March. NB: We are very sorry but we do not have any bursaries available to support your travel. However, we may be able to help with informal accommodation arrangements. Get in touch! Here is a short FAQ about the colloquium with more details about the format, what to expect, and what will be expected of you! Please contact us if you have any further questions.